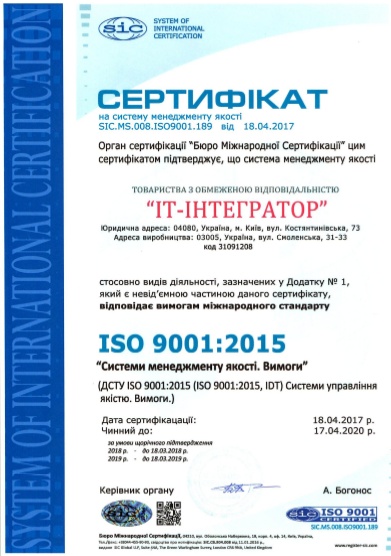 Ukrainian system integrator, has a wide product range and high competencies in the field of IT. The company was founded December 5, 2000. By focusing its activities on advanced technologies, the company offers its customers a wide range of products and services designed to increase efficiency. The company promotes the formation of IT literacy for the development of the Ukrainian economy. "IT-Integrator", focusing on the needs of customers, does not limit its target audience and provides services to both corporate segment, as well as representatives of small and medium-sized businesses, choosing the best solution depending on the specific activity of the company. 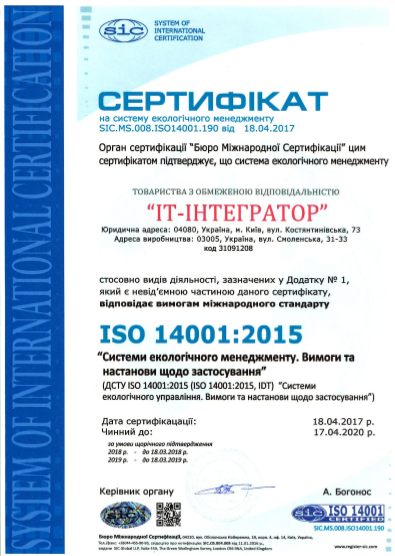 "IT-Integrator" Company declares and affirms its commitment to the principles of ethical business practices and norms of international and Ukrainian anti-corruption legislation, adherence to the requirements of the "Code of Business Ethics" by implementing and managing an effective "anti-corruption program". The Quality Management System and the Environmental Management System are certified for compliance with the requirements of ISO 9001-2015 and ISO 14001-2015, respectively.